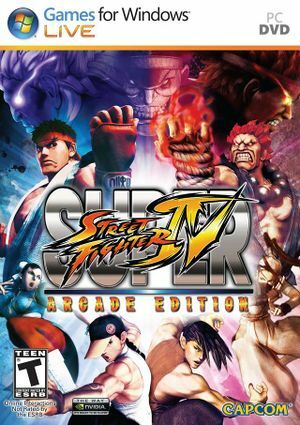 Steam version renamed to Ultra Street Fighter IV. Arcade Edition owners must buy Ultra upgrade to get the new content. All product keys activate on Steam. Use GameCompanion or similar software. Fixed frame rate has to be enabled to prevent broken game speed. 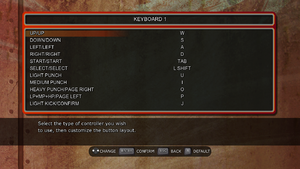 For DualShock use the USFIV Playstation Button Mod. Some language options seems to have vanished after Steamworks update, including Danish, Finnish, Norwegian and Swedish. Steam defaults language to English with these languages. Online features in non-Steam versions require a Microsoft account (optional for offline play). Alt+Tab ↹ out of the game and return. Steam version may try to install dependencies that are already installed. If any of the directx, vcredist or gfwl values are missing, you need to add a string with that missing name, and set it with a decimal value of 1. 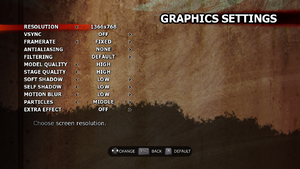 The game runs best when you use the 'Fixed' frame rate option under 'Graphics Settings' and disable VSync. 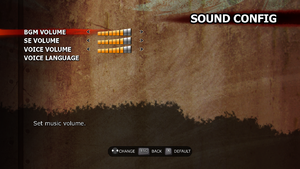 This also fixes some potential online desynchronization issues. Using the 'Smooth' frame rate option can lead to malfunctioning attacks. The game was designed to be ran at a constant 60fps so anything other than a fixed frame rate can cause issues. If you experience tearing, you can enable VSync either through the game or your graphics driver software, but this adds a minor delay in input, though it's not noticeable to most players. Steamworks, Games for Windows - LIVE Non-Steam versions use Games for Windows - LIVE. ↑ Games for Windows - LIVE DRM features: SSA activation, local profile support unknown. ↑ 2.0 2.1 File/folder structure within this directory reflects the path(s) listed for Windows and/or Steam game data (use Wine regedit to access Windows registry paths). Games with Steam Cloud support may store data in ~/.steam/steam/userdata/<user-id>/45760/ in addition to or instead of this directory. The app ID (45760) may differ in some cases. Treat backslashes as forward slashes. See the glossary page for details. This page was last edited on 30 September 2018, at 06:30.